Dotted Lancepod - Lonchocarpus punctatus, which is recognized by the combination of pinnate leaves and purple to white flowers and flattened and pointed legumes. It is a deciduous tree to evergreen shrub that reaches heights of only 60 feet tall. Growing primarily in an erect form with a single trunk and dense rounded crown. 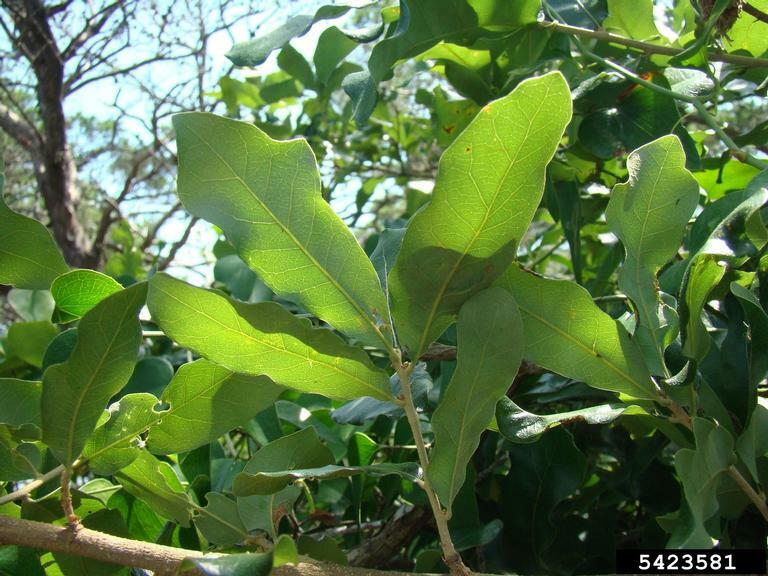 The Dotted Lancepod was introduced from South America and has escaped cultivation and has become established in Southern Florida. The genus Lonchocarpus only includes about 150 species which are distributed in tropical or subtropical regions of America, Africa and Australia the Dotted Lancepod (Lonchocarpus punctatus) is the only species that has been successfully introduced and established in North America. The leaves of the Dotted Lancepod are alternate, pinnate with blades reaching up to 16 cm long and 12 cm long. 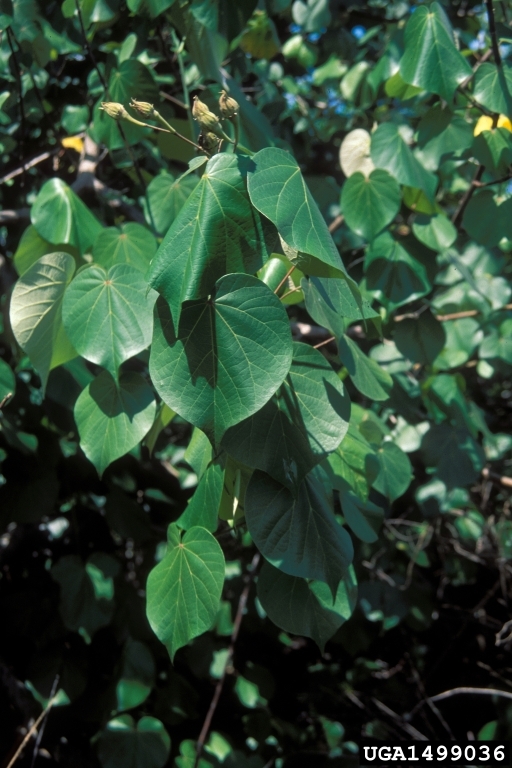 The leaflets occur in 2-8 pairs on each leaf in an opposite form, oval or oblong. The upper leaf surface is a medium to dark green while the lower surface is a paler green. The flowers are bisexual, pink, purple or white in color and 10-15 mm long the petals are upright and finely haired. The flower produce conspicuous axillary racemes about 9 cm long with stalks ranging from 2-3 cm long. The flowers occur year round. The fruit is a flattened brown legume that can reach lengths of 15 cm long, tapering to a point at both ends, usually enclosing only a single seed, sometimes several, more or less flat in form. The Survivor Tree of Oklahoma City is an American Elm that is approximately 90 years old, located in the heart of downtown Oklahoma City. Amazingly it survived the bomb attack on the Murrah Federal Building on April 19, 1995, 23 years ago today. This bombing was the most destructive act of terrorism on American soil before September 11, 2001, the bombing killed 168 people and injured hundreds more. Before the bombing, the tree provided the only shade in the building’s parking lot. It is said that people would arrive early to work just to be able to park under the cooling shade of the tree’s branches. After the bombing, the tree was partially cut down to recover pieces of evidence embedded in it from the force of the devastating bomb. Investigators were successful in recovering evidence from the tree’s trunk and branches. Even after the destruction of the bombing and the destruction during the recovery efforts the tree lived on, a testament to what it means to survive. The Oklahoma City National Memorial and Museum was created to honor “those who were killed, those who survived, and those changed forever” by the 1995 bombing. Hundreds of community citizens, surviving family members who lost loved ones, survivors, and even rescue workers came together to write the mission statement for the memorial. It was decided that “one of the components of the Memorial must be the Survivor Tree located on the south half of the Journal Record Building block.” The Memorial design was unveiled in 1996 with prominence put on the remarkable Elm that had survived so very much. With this, the Survivor Tree has become a symbol of human resilience. Today, as a tribute to renewal and rebirth, the inscription around the tree reads, “The spirit of this city and this nation will not be defeated; our deeply rooted faith sustains us." The tree is a part of the museum, the museum grounds also include a reflecting pool and memorial markers honoring each of the 168 lives lost during the tragedy. 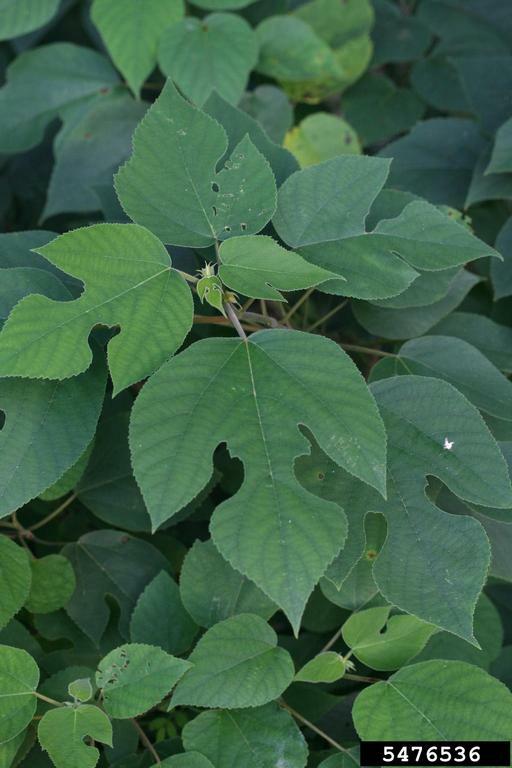 Seedlings from the Survivor Tree are currently growing in Nurseries throughout the state. Each year Nurserymen are given hundreds of seeds by the Facilities and Grounds Crew to continue it's legacy. Located at 620 N Harvey Ave, Oklahoma City, OK You can visit this "WITNESS TO TRAGEDY, SYMBOL OF STRENGTH"
Chokecherry - Prunus virginiana is most easily identified by the combination of bi-color bud scales and broad elliptic leaves with sharply toothed margins. It is a deciduous shrub or tree that reaches heights of 15-30 feet tall with a narrow irregular crown and an erect or leaning form. Native to open woods, and roadsides on rich or moist soils from 0-2600 m. Found from Canada in the North to Georgia in the South, continuing on to the West Coast but absent from the Southeastern coastal plains. Similar in appearance to the Black Cherry and Pin Cherry but can be distinguished by leaf size and shape. The bark of the Chokecherry is smooth, dark brown in color when young becoming black and fissured with age. 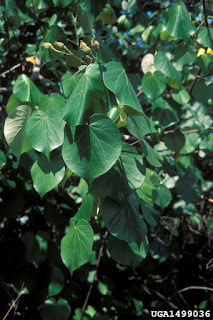 The leaves are alternate, simple, thin (almost papery), obvate, oblong or oval, sharply toothed, dark green upper surface, lower surface paler in color. The leaves become yellow in the fall. The flowers are 8-12 mm in diameter, 5 petals, 15-20 stamens, occuring in mid Spring to early Summer. The fruit is a rounded juicy drupe that is 6-10 mm in diameter maturing late Summer to early Summer. The Chokecherry is recommended for hardiness zones 2-7. Chokecherry is also commonly called Virginia bird cherry. Although common in the wild in many parts of the U. S., this species is infrequently sold in commerce. However, certain cultivars, such as the purple-leaved Prunus virginiana ‘Schubert’, have become popular landscape plants. 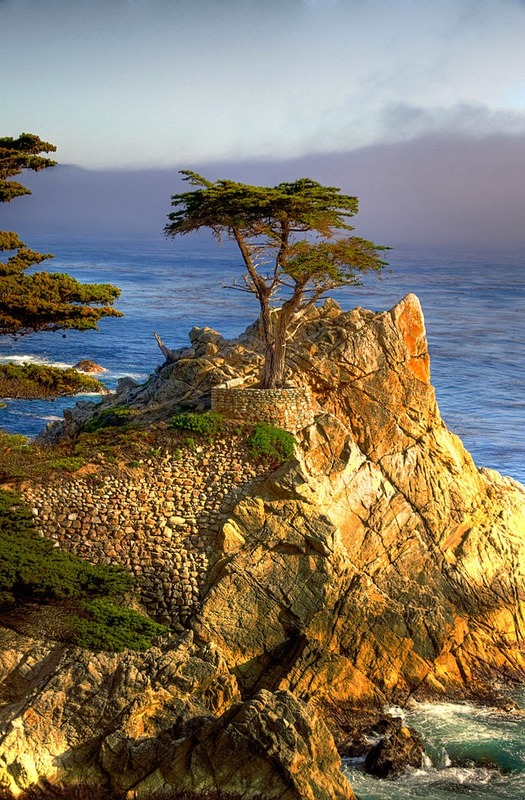 The Lone Cypress - A Monterey Cypress is often said to be the most photographed tree in The United States. Estimated to be over 250 Years old the tree is located within the grounds of The Pebble Beach Resort in California - Arguably one of the most expensive and beautiful Golf Courses in the US. The tree has been injured over the years by fire, winds and storms but remains held in place by an intricate system of support cables. The Monterey Cypress only grows naturally in a two areas of Monterey County, Del Monte Forest and Point Lobos Natural Reserve-but is planted widely as an ornamental. 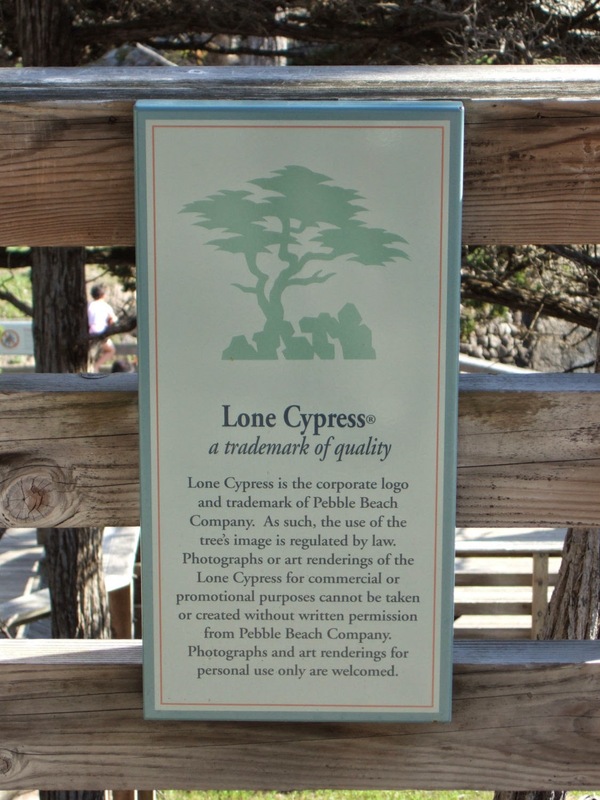 You do have to pay to see The Lone Cypress in person by entering the scenic "17 mile drive", but don't worry it is just $10 a car! This 17 mile scenic route includes some of the most beautiful coastline in California and runs between the Pebble Beach Golf Links and Cypress Point Golf Course through the gated community of Pebble Beach. Also along this scenic route is Bird Rock, Spanish Bay, Spy Glass Hill, Point Joe and the 5300 acre Del Monte Forest. This link will take you to an interactive map of "17 Mile Drive"
In appearance the Chapman Oak is similar to most other Oaks. 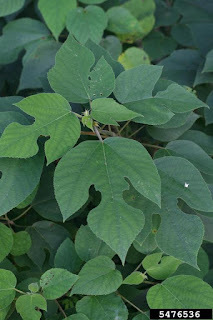 The leaves are alternate, simply shaped, oblong or obovate, thick and leathery with wavy margins on the entire leaf, a dark green upper surface and paler dull lower surface. The fruit is in the form of an acorn with a shallow cup and deep nut, knobby scales and gray-yellow color. The bark is brown, scaly and flaking, similar to many White Oaks. The flower occurring in late winter or early spring is small in size and white-tan in color. Recommended for hardiness zones 8-10b, the Chapman Oak prefers full sun to partial shade and alkaline or acidic soil. Small mammals, butterflies and birds all feed on and/or use the Chapman Oak as shelter. The Heart's A Bustin' - Euonymus americanus is most commonly recognized by the opposite, sessile finely toothed dark green leaves and white flowers arising from the leaf axils. It is usually found in multi-stemmed shrub form but rarely in small tree form. It is also known as the Strawberry Bush or Bursting Heart. The leaf margins are finely toothed with blades around 4 cm long and 2 cm broad. The flowers are creamy white with petals in fours and generally white in color. The fruit is a rounded knobby capsule that splits at maturity to reveal several red coated seeds. The fruit of the Hearts a Bustin matures in the fall. Heart's A Bustin is native to the Eastern and Southern portions of the United States. The Northern range begins in the West from Southern Illinois, through Indiana, Ohio, Pennsylvania, New Jersey, Long Island and the Southernmost portions New York in the East. Southern range is from Texas in the West, through Louisiana, Mississippi, Alabama and Florida in the East. It is most commonly found growing in moist woodlands, and flood plains from 0-500 m.
Meet more trees and shrubs on our website www.ArundelTreeService.com or follow our blog www.MeetATree.com. The Chalk Maple - Acer leucoderme, is most easily distinguished by it's small size and relatively small squarish-lobed leaves that are green beneath. It is a deciduous small tree or large shrub that reaches heights of only 40 feet tall on average. It grows in an erect form generally with a single upright trunk, occasionally a multiple trunk but always with an open spreading crown. It is native to well drained upland woods, stream terraces, calcereous woodlands from 10-300 m, generally restricted to the Piedmont and sparingly in the coastal plains of North Carolina and Virginia on South through Florida, west to eastern Texas and eastern Oklahoma. It is very similar to the Southern Sugar Maple and overlaps in range. The bark is smooth gray in color, the twigs are red-brown in color, lustrous, smooth and hairless. The leaves are opposite, simple, thin and as broad as they are long. The upper leaf surface is a lustrous yellow-green, the lower is a more even green. The leaves turn a beautiful Salmon, Orange, Yellow or Purple-Red color in the fall. The Yellow-Green flower is tiny in size with 5 sepals occurring in Mid-Spring. The fruit occurs in paired samaras 2.5-3 cm long, widely angled from the point of attachment. Sea Hibiscus - Talipariti tiliaceum, is most easily recognized by it's large circular leaves, spreading habit and showy flowers that become a deep red at the end of the day. It is a large evergreen shrub or small tree that reaches heights of only 15-20 feet tall. The trunk of the tree is short, crooked or contorted, with a low branching habit and broad crown. The leaves of the Sea Hibiscus are alternate, simple in shape and almost circular with a heart shaped base. The upper leaf surface is dark lustrous green, the lower a whitish gray. Each leaf blade is 10-30 cm long and 10-30 cm broad and stout. The flowers are Corolla 5-8 long yellow with a red throat early in the day, becoming completely red by the evening hours and dropping during the night hours. The flowers occur year round. The fruit is in the form of a five valved capsule 2 cm broad with numerous black-brown seeds. 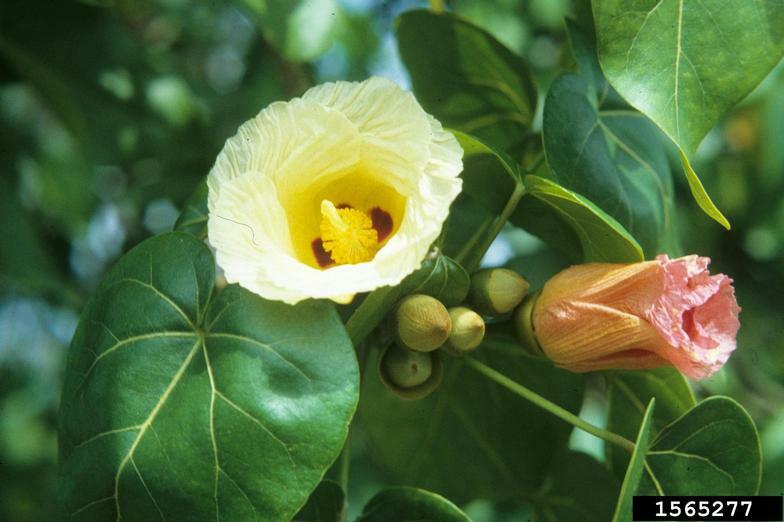 The Sea Hibiscus is native to tropical areas of Asia and is now naturalized along hammocks, roadsides and other disturbed sites in Southern Florida. Sea Hibiscus can be grown as an indoor/houseplant in zones outside of the tropical regions however care is considered to be tough due to lack of humidity in indoor areas. The Paper Mulberry - Broussonetia papyrifera, is a deciduous fast growing tree that reaches heights of only about 30-60 feet tall. Paper Mulberry grows in an erect fashion with a single or multiple trunk, often producing root sprouts and branching low to the ground, the crown is broad and rounded. Originally introduced from Asia in the mid 1700's it is cultivated and established in the Eastern united States from Delaware to Southern Illinois on South from Florida to eastern Texas. The bark of the Paper Mulberry is smooth, tan in color and occasionally furrowed. The twigs are brown with scattered, slightly raised lenticels and long spreading transparent hairs. The leaves are alternate, opposite and whorled, simple, ovate, with a rounded base, and flattened heart shaped or broad wedge shape, toothed along edges. Upper leaf surfaces are dark brown green in color becoming deep green with age. The lower surface is hairy, velvety at maturity. The flowers are unisex, tiny, with male and female produced on separate trees, female inflorence occur in a rounded cluster, the male are elongated cylindric catkin 3-8 cm long occurring in Spring. The fruit matures in Summer and is rounded in a ball like cluster of fleshy calyces that are 2-3 cm in diameter, each calyx encloses a red or orange achene that visibly protrudes on ripe fruit. Umbrella Magnolia - Magnolia tripetala is a small that reaches heights of only 30-40 feet tall and not usually more then 1 foot in diameter. It is most easily identified by it's smooth, thin, gray leather like bark and crooked form. The bark is so thin that when pressed on with your fingernail it will leave a slight indent, this indent will recover once the pressure is released. Umbrella Magnolia is named for the open umbrella like positioning of the leaves within the canopy. The leaves of the Umbrella Magnolia are 10-24 inches long and 5-10 inches wide. Each leaf has a pointed tip that slowly rounds/tapers back to the pointed base. The leaf edges are smooth, occasionally waving up and down along the length of each leaf. The flowers bloom in mid summer and are large in size, fragrant and showy. The fruit of the Umbrella Magnolia is egg shaped and rose colored, maturing in the fall and cracking open at it's many small vertical slits to release red berries. Most often the Umbrella Magnolia is planted as an ornamental because of it's leaves and showy white flowers. It is found growing from Southern Pennsylvania and Indiana through Georgia and Mississippi in the South. Recommended for hardiness zones 5-8, it is most commonly found growing in moist woodland type soils, in full sun or partial shade. Umbrella Magnolias appreciate consistent/regular moisture throughout the year, and are considered to be intolerant of soil extremes. The Green/Red Ash - (Fraxinus Pennsylvannica) is a medium to large, deciduous tree that is native to Eastern/Central North America. This range begins in Nova Scotia, Alberta and Western Colorado in the North and continues through Texas in the Southwest and Northern Florida in the Southeast. It has slowly becoming naturalized in many parts of the Western United States and Central Europe. It grows in a Oval or Upright form. Ash varieties are known to frequently cross or hybridize with one another sometimes causing much confusion with experts trying to positively identify a species. 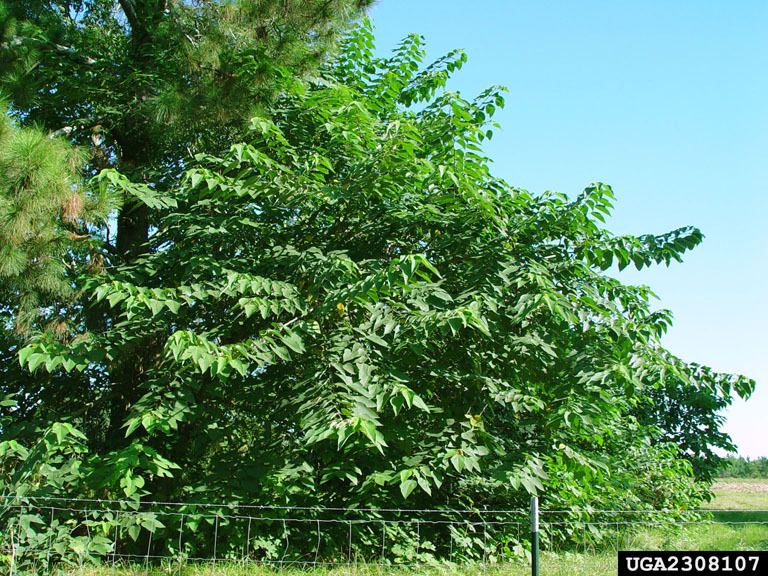 Botanists have recorded that Red and Green Ash were in fact two different species at one time but have completely hybridized to no longer have any unique or differentiating features. The Green/Red Ash are the most widely distributed of all of the American Ashes. Fraxinus Pennsylvanica is a member of the Oleaceae family which also includes Olive, Lilac, Jasmine and Forsythia - all of which are woody trees or shrubs. Fatwood is also known as Lightwood, Pine Knot, Rich Lighter or Fat Lighter originates from the heartwood of Pine trees (Coniferous tree sap). Stumps and Tap root remaining after a tree has fallen or been removed is a good primary source of Fatwood. The heartwood of Pines is impregnated with resins that make them rot resistant and hard. In woods settings Fatwood can also be harvested from the limb intersections and can be used as a firestarter. Most resinous Pines in the United States can produce Fatwood it is most commonly associated with Pinus palustris Longleaf Pine. Terpene is one of the main components of Fatwood (Coniferous tree sap), it is a viscous liquid and a volatile hydrocarbon. Terpene is highly flammable and is used for both kindling and as a fire starter, even in wet conditions it will burn and maintain a high enough heat to light even larger pieces of wood. When using Fatwood to create tinder one would shave small curls and use them to light larger pieces of tinder, gradually working up to larger pieces of wood until a hot rolling fire is created. It is recommended that Fatwood not be used for cooking as the pitch soaked wood produces an oily sooty smoke that can transfer to foods. Worldwide there are 100-125 species that can be classified as resinous pine trees around the world. Distributed around the world in various forms, some of those forms include Scots Pine, Siberian Dwarf Pine, Sumatran Pine, Jack Pine, Loblolly Pine and Caribbean Pine. The area with the most naturally distributed diversity in the genus is between Mexico and California. Fatwood can be found anywhere there is a pine tree or even an old pine stump, it is most concentrated and best preserved in stumps. There are many uses for Fatwood and other resins outside of firestarting. Fatwood is used industrially in the production of turpentine, when fatwood is cooked down in a fire kiln. Steam that vaporizes from the cooking process and becomes a liquid, that liquid becomes turpentine. Cutler's resin is used in the production of knife handles. Resin is used as an ingredient in most nail polishes. Turpentine and Pine Oil are used in many common household chemicals. The American Beech - Fagus grandifolia can be most easily identified by the combination of smooth gray to almost blue gray bark, coarsely toothed leaves and elongated torpedo shaped buds. It is a deciduous tree that can reach heights of near 100 feet if given the right location and ideal growing conditions. Generally growing in an erect upright fashion with a single main trunk and broad open crown. Native to rich woodlands, moist slopes and deciduous forests the American Beech can be found growing from New Brunswick and Ontario in the North South through Texas and Florida between 0-1250 m. It is believed that the best specimens are found growing in the Ohio and Mississippi River Valleys where growing conditions are ideal. Even without leaves the bark of the American Beech sets it aside and makes it easy to identify, smooth in texture and gray to almost blue gray in color it is a stark contrast to the Oak and Pines generally found growing nearby. With age this smooth bark tends to darken and develop cankers or molten in appearance. The leaves are equally interesting, simply shaped ovate or elliptic they are coarsely toothed on the edges. The upper leaf surface is lustrous and dark green in color, while the lower surface is paler and hairy. In the fall the leaves begin to shift from green to yellow, then a lustrous brown and finally a pale brown before falling and making room for new leaves in the Spring. The flowers are tiny, the males are borne in a globular head at the end of a silky stalk, the female are inconspicuous borne singly or in pairs. The fruit is a bristly 4 compartment cupule that usually contains 2 angled or ridged nuts (occasionally 1 or 3). The American Beech is readily available at most nurseries within hardiness zones 4-9, it is a slow grower and can be planted as both a shade tree and an ornamental. Full sun is ideal for the American Beech - meaning it should get at least six hours of direct, unfiltered sunlight each day. Be sure when planted that there is ample space available as when full grown the American Beech can reach heights of 100 feet tall with a spread of 40-50 feet. Beechnuts are frequently eaten by birds and small mammals, they serve as an important food for both chipmunks and squirrels. The Sugar Maple - Acer saccharum (also called Hard Maple, or Rock Maple in certain regions) is a deciduous tree that is well known for it's lovely vibrant fall coloring, large size, larger leaves and winged fruit. Growing in an upright erect form, generally with one single trunk, the Sugar Maple makes for a lovely focal point in any setting. It is Native to much of the Eastern portion of North America from Nova Scotia, Ontario and North Dakota, South from Georgia, Northern Alabama, Northern Louisiana, and Eastern Oklahoma. It slightly overlaps the Southern Sugar Maple in range in the Southern most growth areas only (LA, GA, & AL). The Sugar Maple is a slow growing, long lived tree with specimens recorded as old as 400 years. Commonly found as a tree of importance in various Eastern Forest types including, Hemlock/Northern hardwoods, Beech/Sugar Maple, Sugar Maple/Basswood, Cherry/Maple, and Red Spruce/Sugar Maple. The bark of the Sugar Maple is smooth and Gray when young, becoming irregularly furrowed, scaled and darker with maturity. The leaves are opposite, simple, thin, firm and broader then they are long. Upper leaf surfaces are a dark yellow/green in color, palmately veined with a paler yellow/green or whitened underside. Leaf blades range in size from 7-20 cm long and broad. In the fall the leaves turn a brilliant Red, Yellow or Orange in color. The flowers of the Sugar Maple are tiny they contain 5 sepals that are green/yellow in color, occurring in clusters near the leaf axil in Mid-Late Spring on thin/long drooping stems. The fruit occurs in early Fall in the form of paired samaras that are 2-3 cm long, the pair of samaras almost always forms a U shape where connected. 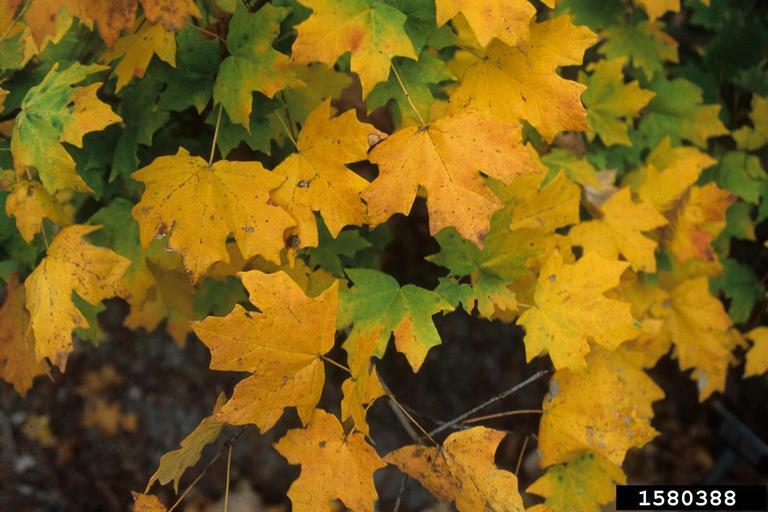 The Sugar Maple is a very popular tree and can be found at almost any nursery in hardiness zones 3-8. 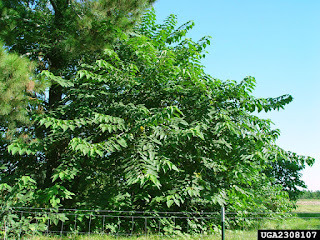 It can be grown as both a shade tree and an ornamental, be careful when planting this tree as although it is a slow grower it will get very large with age 65-75 feet tall and 40-50 feet broad (canopy). 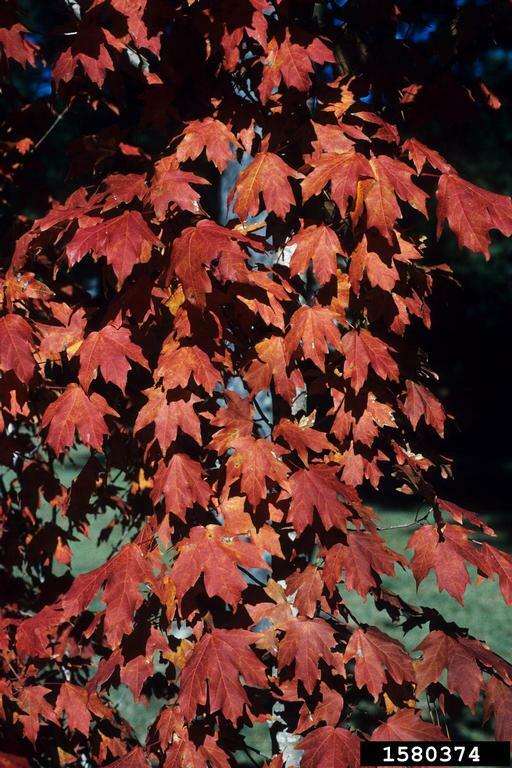 The Sugar Maple prefers partial shade or full sun and deep, well-drained, acidic to slightly alkaline soil. Sugar Maple also has a moderate drought tolerance. 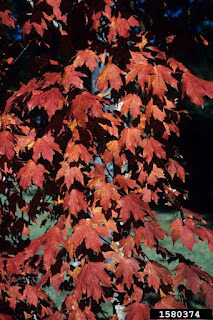 Sugar Maples are commonly browsed upon by Whitetail Deer, Squirrels, Moose and Snowshoe Hares. Sugar Maple is the Official State tree of New York, West Virginia, Wisconsin and Vermont (more states than any other tree).